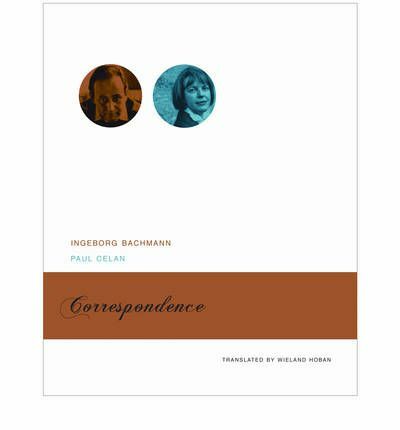 This week I finished reading the Ingeborg Bachmann Paul Celan Correspondence in Wieland Hoban's translation presented in Seagull Books' smart, square edition. If there is a review to be written, Shigekuni has written it, and more. So go there for his clearer reading. I will write something else. It was not the collection I had expected. There is little discussion of poetry and only brief references to works in progress or responses to published work. Unlike the first volume of Beckett's letters, there is little to make the reader pause to copy down lines or phrases. To mine for quotations would probably discolour the character of reading the correspondence as it follows the arc of a lifelong friendship. Reading across over twenty years of haphazard communication is to share in what we may call an infinite holding-between between two lovers now separated for ever. It is an uncomfortable sharing, even more so than Kafka’s loving and distressed letters to Felice, though perhaps only because of the proximity in time. For the most part, however, the letters are reticent approaches by two people who maintain long-term relationships with other partners and express no wish to end them, yet who also remember the brief flaring of an affair as if it expressed the essence of something purer, perhaps of poetry itself. Much is discussed in the letters in a context that can only be guessed at, so impressions like mine are inevitable and, to their credit, the editors do not attempt to report the background any more than evidence allows. Despite the lack of poetry, the first letter is in fact an original poem: Celan sends In Ägypten (you can read a translation via the link) and dedicates it to Ingeborg on her 22nd birthday. Andrea Stoll describes it as "a love poem that announces nine commandments of love and writing after the Shoah". Later Celan says: "Every time I read it, I see you step into the poem: you are the reason for living, not least because you are, and will remain, the justification for my speaking." Perhaps we can appreciate from these words the real, physical grip of Celan's terrible bind and therefore why poetry was so important to him. Put crudely then, Bachmann, the daughter of a Nazi party member, a Heidegger scholar and German poet, represented both Celan's love for the German language and hope for its homeland's atonement. In his letters, the progress of his writing stands for the health reports one might read anywhere else. He is often afflicted by silence due to private or professional hurts. The cumulative effects of both erupt late in the correspondence and turn the book into something much more harrowing than the reader had come to expect from what had preceded it. 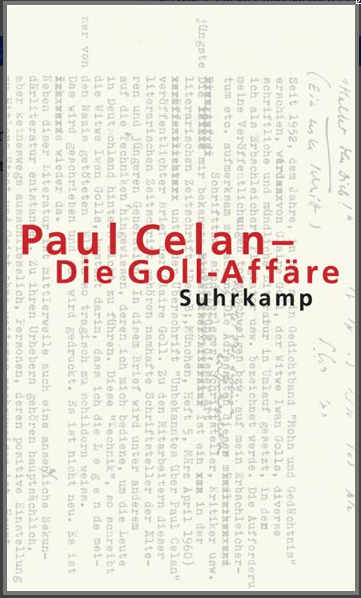 This is what has become known as The Goll Affair, a scandal in which the widow of the poet Yvan Goll accused Celan, who had translated his work into German, of plagiarism. 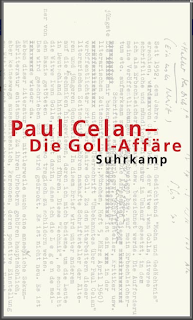 Benjamin Ivry explains how "some postwar German literary critics took up cudgels on [Goll's] behalf, scorning Celan in reviews that reeked of subtle and not-so-subtle antisemitism, and alluding to his supposed greed for money or to his lack of originality". I also think to myself, especially now, having garnered experiences with such patented anti-Nazis as [Heinrich] Böll or [Alfred] Andersch, that someone who chokes on his errors, who does not pretend he never did any wrong, who does not conceal the guilt that clings to him, is better than someone who has settled so very comfortably and profitably into the persona of a man with a spotless past, so comfortably that he can now – only 'privately', of course, not in public, for that, as we all know, is harmful to one's prestige – afford to indulge in the most shameful behaviour. In other words: I can tell myself that Heidegger has perhaps realized some of his errors; but I see how much vileness there is in someone like Andersch or Böll. While it is understandable for Heidegger's philosophy to be still treated with contempt by narrow minds like Emmanuel Faye and his dupes, it is perhaps more shocking that Celan also receives condescension from a modern-day Böll or Andersch such as Clive James. Duncan Law summarises James' piece on Celan in what apparently passes for great essay writing in this country. The volume ends with Gisèle Lestrange's warm letters to Bachmann following her husband's suicide aged 50. Bachmann herself would die in tragic circumstances three years later. Thinking over my experience of reading these letters armed with such knowledge, I recognised the dangers of writing in a literary world policed by gatekeepers like Clive James. I also wondered if this is perhaps necessary for writing such as Celan's to make its way into our lives. Let me explain: think of Georg Bendemann writing to his Russian friend in Kafka's The Judgement and how this unhurried, sunday morning politeness is disturbed when his father questions Georg's habitual dissembling to his innocent friend and denounces his betrayal of his mother's memory by getting engaged to that "nasty creature" who lifted her skirts. Georg's only means to continue, he realises, is to throw himself from the nearest bridge and to drown in the river. By continuing, he lives on in the real world, but it is a continuation borne on the pain of terrible transformation. And this is, of course, as I now realise, Paul Celan's story. In most cases, fatigue is brought on most quickly by cognitive effort, desk work, reading, or any activity that needs attention. This is taken from a website discussing the daily effects of brain injuries. It explains more to me than the NHS ever did. Apparently, patients suffering from a head injury report that at first they have a feeling of energy, "then, fairly suddenly," the website continues "like a curtain falling down, they find they are struggling to keep going; and can't make sense of what they're doing." This, to my surprise, matches a familiar pattern in my workaday life. It also explains why this blog has not seen the many book reviews that I had planned to produce in order to start more literary fires. Worse for me is that the website is describing the effects of a mild head injury, and mine was not mild. For a long time, I've wondered how to write when the cognitive resources required have been already exhausted. Mostly I think it's an excuse: isn't this what real writers do all the time – work hard despite the damage it delivers? Think of Nietzsche and his headaches, Henry James and his tendinitis, the late Christopher Nolan. What ever the answer, the physical response is the same: the curtain sweeps down. So, rather than keep on waiting for the same answer, I wonder if fatigue should be regarded as an obstacle. If work is the activity that shuts everything down, then can writing be done when it isn't work? Haven't I always found the most promising ideas arrive when I am farthest from purposeful thought: strolling along the seafront, sitting in silence waiting for a train, drifting off to sleep? These are times, I recognise, much like reading and writing, when only possibility is possible. I remember the artist Emma Sargeant describing how her best work emerged only when she was tired at the end of a long day, and how Stockhausen once stayed awake for a week to see what came into his mind. Don't these point the way? Except both painting and composing demand a certain loss of control and surely writing is nothing if not mastery over form and content. Could it be, however, that this mastery is precisely what hampers the breakthrough? I wanted nothing from them; just being able to look at them was enough for me. My gaze was indeed that of a good spectator at a game that cannot be successful without at least one such onlooker. This tired man's looking-on was an activity, it did something, it played a part; because of it, the actors in the play became better, more beautiful than ever – for one thing because, while being looked at by eyes such as mine, they took their time. As by a miracle, the tiredness of such an onlooker nullified his ego, that eternal creator of unrest and with it all other distortions, quirks, and frowns. [...] The action of this selfless onlooker encompassed far more than the beautiful female passerby and drew everything that lived and moved into its world center. My tiredness articulated the muddle of crude perception, not by breaking it up, but by making its components recognizable, and with the help of rhythms endowed it with form – form as far as the eye could see – a vast horizon of tiredness. Because of my tiredness, the thousands of unconnected happenings all about me arranged themselves into an order that was more than form; each one entered into me as the precisely fitting part of a finely attuned, light-textured story; and its events told themselves without the mediation of words. Thanks to my tiredness, the world cast off its names and became great. I have rough picture of four possible attitudes of my linguistic self to the world: in the first, I am mute, cruelly excluded from events; in the second, the confusion of voices, of talk, passes from outside into my inner self, though I am still as mute as before, capable at the most of screaming; in the third, finally, life enters into me by beginning spontaneously, sentence for sentence, to tell stories, usually to a definite person, a child, a friend; and finally, in the fourth, which I experienced most lastingly in that day's clear-sighted tiredness, the world tells its own story without words, in utter silence, to me as well as to that gray-haired onlooker over there and to that magnificent woman who is striding by; all peaceable happening was itself a story, and unlike wars and battles, which need a poet or a chronicler before they can take shape, these stories shaped themselves in my tired eyes into an epic and, moreover, as then became apparent to me, an ideal epic. The images of the fugitive world meshed one with another, and took form. English readers may view Vila-Matas as too self-absorbed, too self-referential in his choice of the pursuit of literature as the exclusive subject of his fiction. Modernism in fiction may be acceptable, but such postmodern games still seem too much of a Continental fashion. Yet Vila-Matas's obsession shows that the quest to create literature is a metonym for the ability to live a life that has some meaning, rather than being entirely absurd. His creations suffer because of their obsessions, and all risk ending up like Herman Melville's scrivener, locked away for their refusal to compromise with "normality". Nick Caistor reviews Enrique Vila-Matas' Dublinesca, his new novel in Spanish. Vila-Matas insists that there is a "moral contract" between writer and reader, and that the reader should be active, showing a "capacity for intelligent emotion, a wish to understand the other person, and to get closer to a language that is different from that of our daily tyrannies". He goes further, declaring that: "the same skills needed to write are also needed to read. Writers can fail readers, but the reverse is also true, and readers fail writers when all they look for in them is a confirmation that the world is exactly how they see it". In spite of all the playfulness therefore, the game of literature is the most serious and urgent there is. [T]hough critics and reviewers in the English language today pay lip service to T. S. Eliot and Virginia Woolf, and even Beckett and Borges, they seem not to have grasped what it was these writers were up to, the radical nature of their critique of the arts in our time. That is what [What Ever Happened to Modernism?] is about, though it seems that in England today journalists are only interested in raking mud.